Three weeks post surgery and I’m really beginning to feel better. Still a touch sore on the inside of my right knee where they went in to repair my meniscus and remove some small amounts of arthritis. Basically I pretty much haven’t done a stitch of exercise since Christmas Day when all this went down and it shows. Man are my calves sore! My body wants to consume food as if I was still running 30 miles a week and the scale well that thing and I haven’t been friends for a while now. None the less yesterday was a beautiful day with bright sunshine, a light breeze and some cool spring temperatures. Going stir crazy I decided to head over to the Vestal Rail Trail and do some walking. I wound up walking 4 miles with minimal discomfort and a tiny bit of soreness. This is huge in the process of healing! On April 11th I return to see my doctor for a checkup and his thoughts of when I can start slowly testing the waters of running again. My fingers are crossed that come end of April I can return. It will take me a while to get back into shape but I’m all about baby steps and doing this process right. 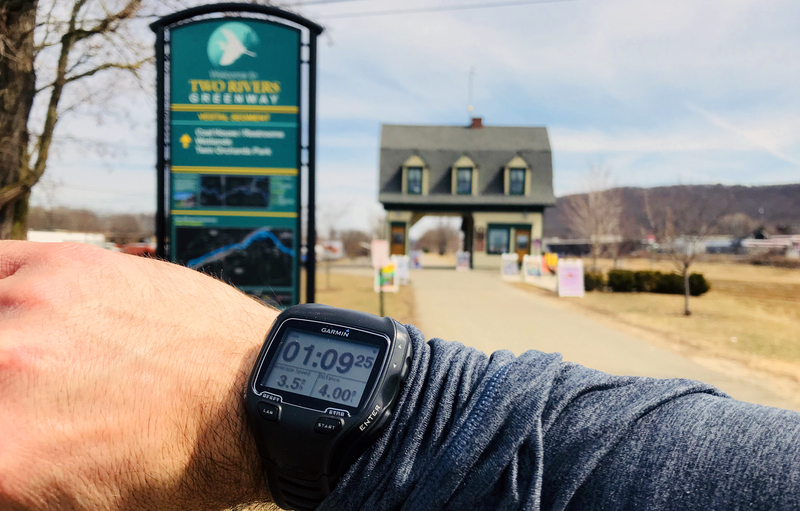 Finished my 4 mile walk on the Vestal Rail Trail March 27th 2019. Good luck to you Joe!